Pink silk scarf made of georgette fabric. Georgette fabric is often used for bridal attire. 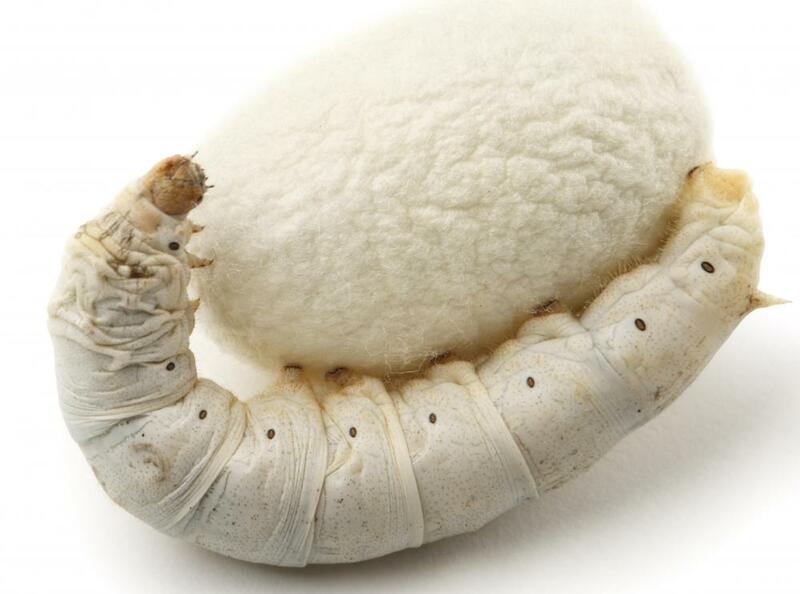 Crape is a fabric traditionally made of silk, which comes from the cocoon of the silkworm. Georgette fabric should typically be hand washed in cold water with mild detergent. Georgette fabric is a textile traditionally made from silk, although synthetic fibers such as polyester are sometimes used as well. The thing that makes georgette fabric distinctive is the crinkly crepe-light texture, which feels slightly rough and dull, but gives the fabric a bouncy, flowing look. Many fabric stores carry georgette fabric in a range of colors and prints for various projects. Department stores also carry clothing and drapery made from georgette. 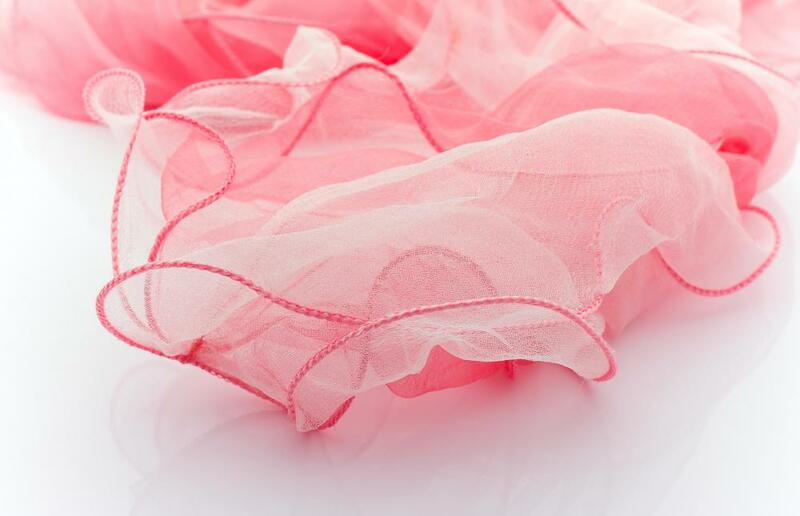 The threads used in georgette fabric are highly twisted, which causes them to crinkle as they relax. The weave of georgette tends to be rather tight, but the overall appearance is slightly sheer, since the threads are very thin. Unlike some fine silks, georgette fabric is also unusually strong, and it holds up well to varied wear. Since silk is highly absorbent, georgette fabric can easily be dyed in a myriad of colors, or printed with a pattern. The crepe-like texture of georgette fabric makes it very springy, so that the fabric almost appears to move on its own. It also drapes very well, making it a popular choice for women's fashions in which clingy, flowing fabrics are favored. Since georgette fabric is thin, it is also lightweight, and can be used as a layer in a larger garment without being heavy or bulky. Layers of georgette fabric may be used for a fanciful effect, especially in gowns. Bridal gowns, evening dresses, and other formal wear are sometimes made with georgette fabric. It may also be used to make jackets and shirts, usually for women. The fabric can be left plain, or decorations such as embroidery and beading may be added. 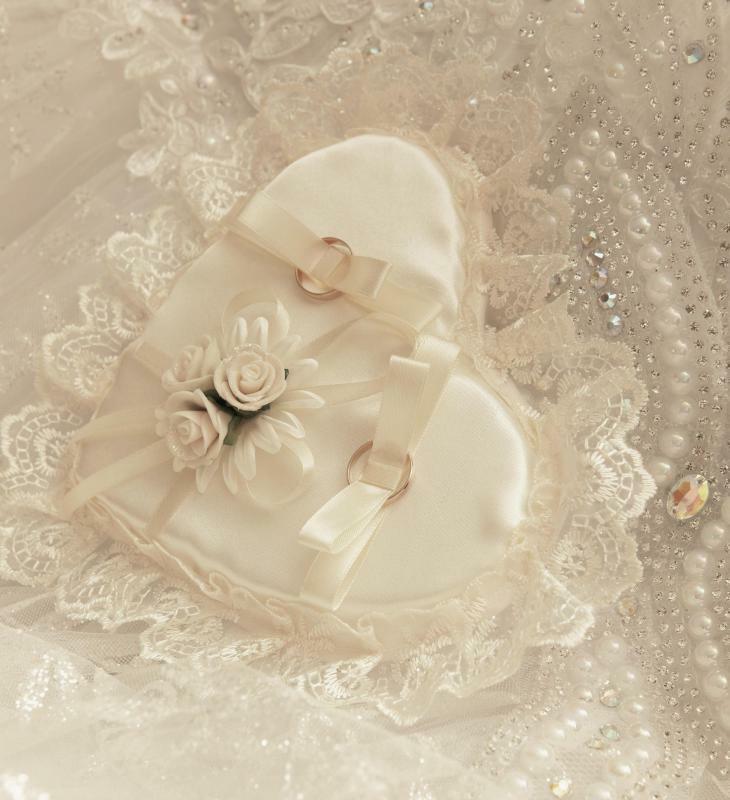 Decorations are usually kept simple so that they do not drag the fabric down and pull the garment out of shape. High load seams may be doubled to ensure that the fabric does not unravel. Because georgette fabric is textured and slightly slippery, it can be difficult to sew. Interweaving tissue paper or something similar can help to keep pieces of the fabric together while they are worked on, and pins should be used with caution since georgette fabric can show pin holes. As a general rule, georgette fabric can be hand washed in cold water with mild detergent and hung to dry, although it should be kept out of the sun to avoid fading. In some cases, dry cleaning may be necessary; always check product tags to make sure that you care for the garment as the manufacturer recommends. How do I Choose the Best Smocking Fabric? In Fashion, what is Plisse? What different qualities of georgette and chiffon are there? What is the meaning of 60gms or 70 gms chiffon? What is the content of georgette 30gms, 50gms, and 60gms? I was wondering if georgette is a sustainable material? Hopefully you can help. can you dye a georgette saree? what is the difference between crinkled crepe georgette and double georgette. I know what the crinkled looks like but was wondering if double georgette is the same? Pure georgette is short for 'pure-silk' georgette, meaning the fiber used is natural silk not polyester or rayon. Sheri: You can spot wash your dress using a mild shampoo, but be careful; the color might run. if that doesn't work take it to the dry cleaner. How do you pronounce the two "G's" in georgette? I thought it is like jorjet, but recently saw a native language ad by a big trading house pronouncing both the Gs like the G in goat. A narrow rolled hem would work well. You should be able to get the rolled hem foot as an attachment for your machine. A rolled hem looks great but takes a little practice. Good luck! only thing I could tell you about how to tell if the fabric is silk or polyester is to take a very small sample, maybe from a seam, and holding it in a pair of tweezers burn it. if it smells sweet, and forms a shiny hard ball, its synthetic. 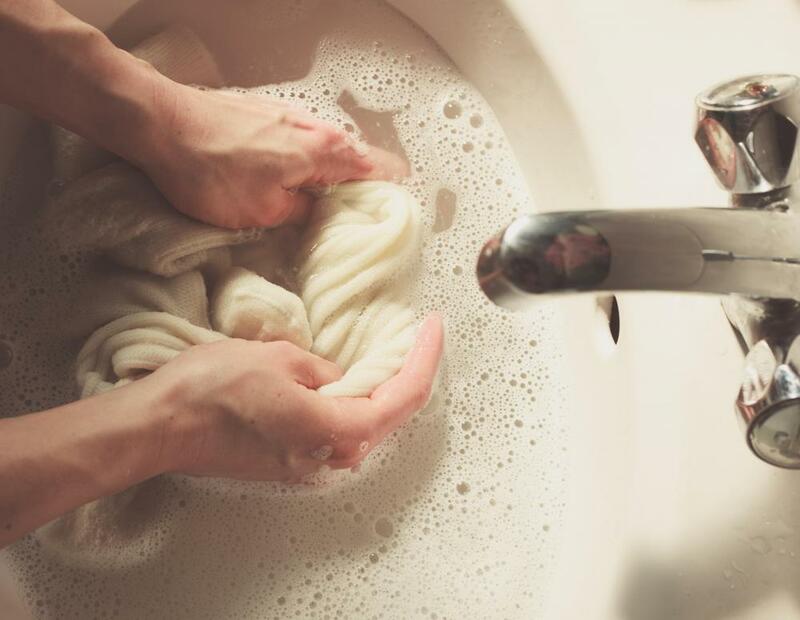 if it smells sort of like hair, and curls away from the flame when you hold it close and forms a soft gray ash, then it is silk or possibly rayon. can you tell me the difference in what they mean on saree sites when they distinguish between "pure georgette" and "faux georgette"? in English, georgette is a weave, not a fiber. what different qualities of georgette and chiffon are there? what is the meaning of 60gms or 70 gms chiffon? What are the content of georgette 30gms, 50gms, and 60gms. what different qualities of georgette and chiffon are there? what is the meaning of 60gms or 70 gms chiffon?